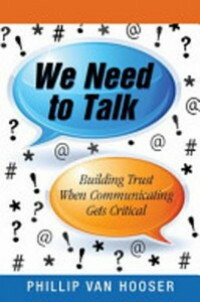 Strategies for Successfully Communicating Critical Messages. And get results by guaranteeing the message you intended was interpreted correctly. Within days of readying We Need to Talk, I applied two of the principles Phil described and was beyond thrilled at the outcome…I was utterly amazed at how easy it was to have the conversation. Every manager, no matter how experienced, can benefit from this book.